Nandita Shenoy and Johnny Wu in WASHER/DRYER. Photo by Isaiah Tanenbaum. BOTTOM LINE: A comedy about relationships, ethnic relatives, and New York City real estate. Upon entering the theatre you are immediately enveloped by an expansive, detailed Manhattan studio apartment—nothing out of the ordinary for the New York audience. 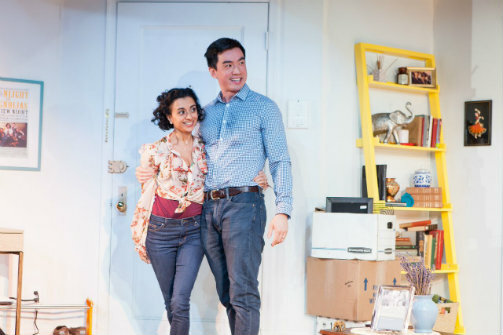 Sonya (Nandita Shenoy, also the playwright) and Michael (Johnny Wu) live in this apartment. Their relationship started when they bought a Groupon-inspired trip to Las Vegas and got married at the Little White Chapel shortly after dating for three months. Back in Manhattan, Michael brings home an electric wok, a housewarming gift from his Chinese mother. Sonya is not comfortable about this new addition to the apartment space. First, it is the addition of new appliances on top of Michael’s recent move-in, and second, Sonya doesn't seem to be ready for this new “spatial” intimacy. As it turns out, Sonya bought her prized Upper East Side studio apartment with all the money that she could save up as a middlingly successful actress. But there is a little secret she has yet to tell Michael, explaining why the doorman repeatedly announces Michael’s arrival. Sonya has not (and will not) tell anyone in the building about Michael, including the doorman and other building neighbors, even her good friend Sam who lives downstairs, because she owns a single occupancy apartment in a co-op building. In other words, Michael, her newly wedded husband, can only stay in this apartment as a “guest” for the indefinite future. Why does Sonya caresmore about the apartment than her new husband? You guessed it, the apartment includes a washer/dryer—a luxurious possession and the holy grail of Manhattan real estate. As the play progresses, Shenoy introduces many caricatures. Dr. Lee (Jade Wu) is Michael’s domineering Chinese mother who secretly follows her son home after they met for lunch, to find out his new address. “She’s not a psychotic stalker,” explains Michael, “she’s an Asian mother!” The stereotypes of Dr. Lee (i.e. changing into slippers every time she enters the house, that her criticisms are “an expression of her love,” or the notion that "sons are like gifts from God," are older than Amy Tan’s 1989 Joy Luck Club). Shenoy seem to bring these up to make us laugh, but some feel so overused these days and the playwright only touches skin deep when they could be culturally interesting moments. Other funny caricatures include the greedy and mean co-op board president Wendee (Annie McNamara), the flamboyantly gay downstairs neighbor Sam (Jamyl Dobson), and Sonya’s loving Indian grandmother (a voiceover) who sent a stereotypical duck-taped piece of luggage from India filled with valuable Indian wedding items. Everything in WASHER/DRYER takes place within the studio apartment. The pace is evenly timed at a slick 90 minutes, directed seamlessly by Benjamin Kamine. The painstakingly-detailed set (even the hallway outside the door is decorated) is by Anshuman Bhatia. The lighting by Jonathan Cottle and sound by Miles Polaski are memorable and fitting. If you are looking for a light evening with easy laughs, and don’t mind clichéd stereotypes, this is a play worth attending. WASHER/DRYER is written by Nandita Shenoy and directed by Benjamin Kamine. Set Design is by Anshuman Bhatia. Lighting Design is by Jonathan Cottle. Sound Design is by Miles Polaski. Stage Manager is Shelley Miles. The cast is Johnny Wu, Nandita Shenoy, Jade Wu, Annie Mcnamara and Jamyl Dobson.